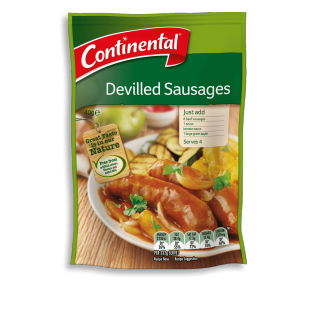 Continental's devilled sausages recipe base contains a classic sauce for the meat which is mildly spiced but also slightly sweet and tangy. Learn more here. Corn starch, sugar, vegetable powders (tomato, onion), natural flavours (contain wheat and soybean derivative), spices, burnt sugar, mineral salt (potassium chloride), salt, yeast extract, sunflower oil, garlic extract, maltodextrin (from wheat). Allergens:Contains wheat and soybean products. Made on equipment that also processes products containing milk, peanut, egg, sesame, fish and crustacea. Continental teaches you how to cook steak to a tender perfection. Choosing the correct meat cut & cooking length is key to a succulent steak. Learn more. Learn what you can freeze and what not to freeze. Plus tips on how to use and prepare foods after defrosting. Hi, you can actually still find our Devilled Sausage Recipe Base in Coles & IGA/Metcash stores.